The ONC Certified Health IT Product List (CHPL) contains a comprehensive listing of health IT products, systems, and modules certified by the Office of the National Coordinator for Health Information Technology (ONC). Importantly, CHPL includes electronic health record (EHR, EMR) systems and modules that are certified for CMS EHR Incentive Programs. The Centers for Medicare and Medicaid Services (CMS) and ONC have established, and/or use criteria for certification of electronic health IT products and EHR technology. The intent of establishing health IT (HIT) product certification criteria includes assuring the functionality, confidentiality, and interoperability of HIT products that are utilized by providers and stakeholders of care. 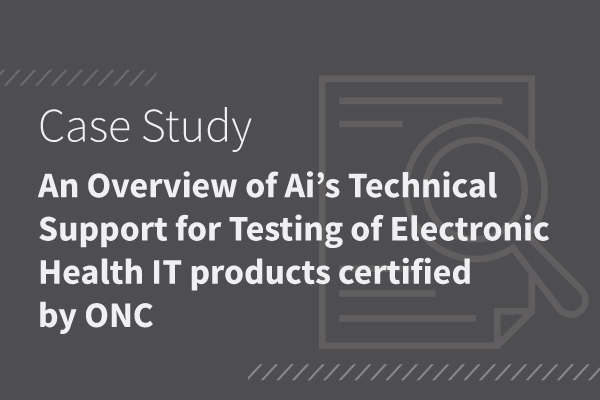 What is Ai’s role in technical support, testing, and/or maintenance of ONC’s CHPL and testing towards certification of HIT products, including EHR technology? Ai provides technical and IT services to maintain and sustain the functionality of the Certified Health IT Product List (CHPL). Ai also provides support for Test Method development towards testing and certification of HIT products for CHPL. The Test Methods planned and supported by Ai may cover unit testing; scenario testing; development and programming; enhancement via crowd sourced test methods; and assessment and validation of test procedures, test data and test tools submitted from outside sources. The Test Method is planned or updated to reflect ongoing feedback received during the certification activities. This work includes, among other services, collaboration with National Institute of Standards and Technology (NIST), to design test tools that will be used to certify that EHR technology is capable of producing results that align with industry standards and regulations to support enhanced interoperability. ONC’s HIT Certification Program and the CHPL enable providers and hospitals to use CHPL “to identify the certified health IT they use and, if necessary generate the CMS EHR Certification ID required for meaningful use attestation. These programs collaboratively build the foundation for every patient to benefit from an EHR, as part of a modernized, interconnected, and vastly improved system of care delivery.” Products can be listed on the CHPL after they have been successfully tested. Ai is pleased to serve ONC in its continued progress in HIT product certification. In our experience, this work serves the greater objectives to improve healthcare delivery and strengthen data exchange infrastructure. The CHPL project is also important because it aligns with increased adoption of EHRs, and evolving interoperability and value based delivery models. “Setting Value-Based Payment Goals—HHS Efforts to Improve U.S. Health Care” Burwell Sylvia M. N Engl J Med 2015; 372:897-99. March 5, 2015.